Natural Healing Tools: Ginger Better than Drugs for Pain? New research in the Journal of Pain reports that ginger is an effective natural anti-inflammatory that helps reduce pain and inflammation. Both raw ginger and heated ginger were used in the study with similar effectiveness. The scientists specifically explored ginger’s effects on muscle pain. Ginger has been used medicinally for thousands of years in Ayurvedic medicine in India as a natural anti-inflammatory food. Dr. Krishna C. Srivastava, a world-renowned research on the therapeutic effects of spices, at Odense University in Denmark has also conducted extensive research into the anti-pain effects of ginger. 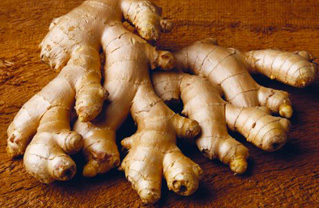 In one study, Dr. Srivastava gave arthritic patients small amounts of ginger daily for three months. The majority of people had significant improvements in pain, swelling, and morning stiffness by eating ginger daily. I regularly use ginger to address muscular or joint pain and inflammation. The amount used in Dr. Srivastava’s study was 5 grams of fresh ginger or 1 tsp of dried ginger, in divided doses throughout the day. Fresh or dried ginger can be added to stir-fries, curries, soups, or made into tea. I chop a two to three inch piece of fresh ginger, add it to a quart of water and boil on the stove for 30 to 60 minutes. Add one to three drops of stevia to sweeten each cup of tea. Drink three cups daily for arthritic or muscle pain. The above information is provided for educational purposes. Always consult a health practitioner before using herbs, particularly if you take pharmaceutical drugs.